Our Blackpool team would like to thank everyone who attended our Dementia Lunch and Learn on Thursday 26th October 2017. 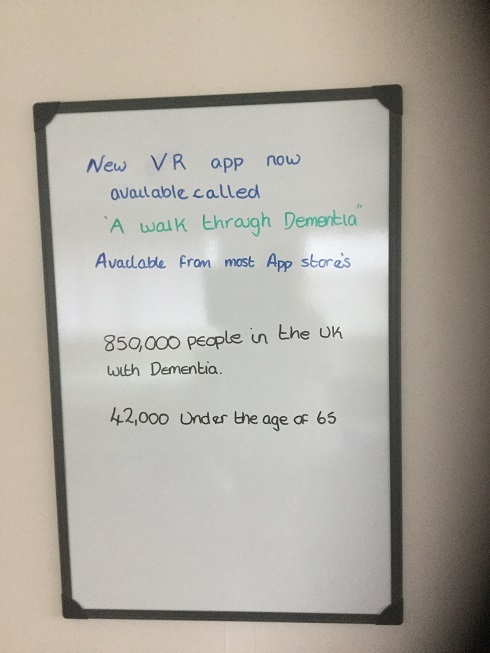 All our staff tried the walk through dementia app on our VR headset. This amazing piece of equipment helps participants simulate the life of a client living with dementia. Staff feedback was “It was invaluable and we didn’t realise that this is how they see every day” “Wow, how scary must every day be”. Thanks to our Lunch and Learn we also have 4 members of staff signing up to be dementia a friend. For more information please contact the branch on 01253 922 128 or e-mail Blackpool@routeshealthcare.com.